The Nationals beat the Mariners Thursday afternoon to boost their record over the .500 mark. It's the latest in a season the Nats have had a winning record since the next-to-last game in 2005. And now they need a new manager. 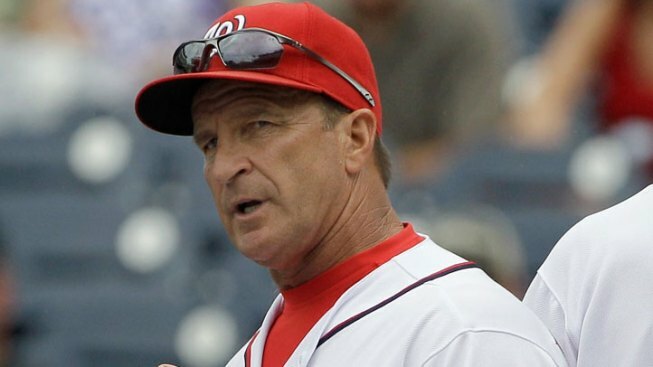 Nationals GM Mike Rizzo said manager Jim Riggelman resigned after the 1-0 win Thursday. "This is not thinking of the team first, it's thinking of personal goals and personal things first," Rizzo said. "That's probably what disappoints me most." Riggleman apparently gave the Nationals an ultimatum to either give him a new contract by today or he would resign. The contract didn't come, and Riggleman is gone. Riggleman is in the last year of his contract. There was an option on the table for next season at a reported salary of $600,000, but the Nats weren't ready to make the commitment, and apparently Riggleman wanted something more secure. The Nationals seemed to be stunned by the move. Rizzo said he had a discussion with Riggleman before the game that "if we wouldn't pick up his option, he wouldn't get on the team bus today." "As you can see, it has taken us a little bit by surprise," Rizzo said in a news conference usually conducted by Riggleman after the game. "We don't have an immediate plan for a successor as manager. By Monday we will have an answer and have somebody managing the team. By no means is there no leadership and a person in charge of the organization. We feel that we're going in the right direction. We continue to feel that way. The leadership is very, very strong and committed to putting a winner on the field, a championship-caliber organization, and we will be committed to that." Rizzo said the ultimatum before the game was the first one Riggleman had issued to him. He said he spoke to him again immediately after the game, and that Riggleman informed him that nothing had changed. "I know I'm not Casey Stengel, but I do feel like I know what I'm doing," Riggleman said after the game. "It's not a situation where I felt like I should continue on on such a short leash. The game's not fun that way. ... I just wanted to have a conversation when we got to Chicago about it. Mike said he's not ready to have that conversation. I respect his decision, and so I said, 'Well, I've gotta give it up then.'" Rizzo said the players weren't aware of the situation before the game, but he told them what happened after the game. He said that because of the big win, it was an "extremely festive, upbeat locker room," but that feeling soon was deflated. "It became somber very quickly," Rizzo said. As for why the Nationals wouldn't pick up Riggleman's contract at a point when the team was doing so well, Rizzo said it just wasn't the time, and he wanted to see how more of the season played out. "We have discussed his option being picked up several times during the season," Rizzo said. "I felt that the time wasn't right to pick up the option at this time. And certainly today's conversation, put to me in the way it was put to me, you certainly can't make that decision in a knee-jerk reaction. ... Jim's timetable was prepared to make and I was not." So the Nats now find themselves in third play in their division -- nine games behind the Phillies -- and embarking on a road trip to Chicago without a skipper. "Very disappointing," Rizzo said. "Disappointing to the players in the clubhouse, to the fan base of Washington, to the city of Washington, D.C., and personally to myself."